Benjamin Wilson from HackEDA knows that smartphones are a part of everyday life now, but he feels they might be too smart. If you told a hacker about a powerful programmable system with a durable case, rechargeable battery, button controls, LED screen, and wireless capabilities they’d be excited to use the new tool. But then tell the hacker that this new tool is a smartphone and the enthusiasm would evaporate. Most consumer phones have no available connections for the users, and are not designed for disassembly or modification. 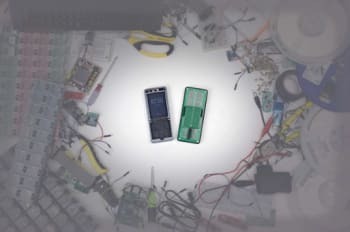 HackEDA’s solution is the WiPhone, a tool for engineers and makers to “build your prototype right on the back of the phone”. WiPhone has been in development for a year and currently running a successful Kickstarter campaign. 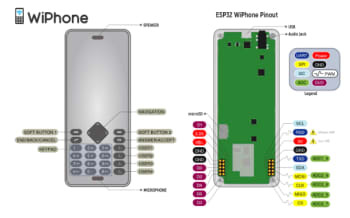 The WiPhone has ESP32 dual core wireless modules, 16 MegaBytes of Flash memory, 4 MegaBytes of pseudostatic RAM, and headers to connect UART, SPI, I2C, PWM, digital input/output or ADC boards. The entire phone is 120 x 50 x 12 millimeters and weighs 80 grams. The phone has a polycarbonate case and a replaceable printed circuitboard on the back panel. The 700 milliAmpere hour battery holds an estimated 8 hours of talk time and one week of standby time. Four of the keypad’s twenty five buttons are reserved for user defined functions and all buttons are programmable. VoIP functionality even lets you use the WiPhone like a phone. Programming is done mainly through Arduino, C++ or Python and the open source community isn’t available to the public yet but will include basic tutorials. Based on the campaign video and the sample projects made here the WiPhone looks like a great tool. I like the idea of the easy disassembly and the pinouts on the phone back for users. The campaign shows an LED panel back called the Sparklepony and a small phone-with-wheels vehicle that rings and answers the phone by driving around. The WiPhone’s crowdfunding campaign is already successful and will end on April 16, 2019.